The artist Animtim I met at Amsterdam KritaSprint 2011 use a Joypad+tablet to work. He gaves me precious infos about how simple it was to attribute keyboard shortcut using the FLOSS Qjoypad. This ideas mixed in my mind and made me want to stick a flat gamepad on the Cintiq to replace default button. That why I decided to 'flatten' an old Logitech Precision Gamepad I had to try it. 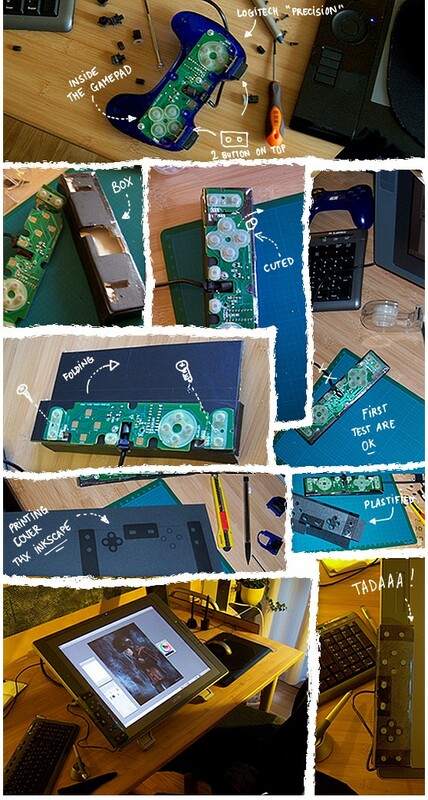 But, if you are not tempted by DIY stuff, a lot of mini gamepad flat exist on the market for very cheap ( exemple , Dicota mini gamepad ) , and if you want to try , you will surely prefer to purchase one and stick it on your tablet with adhesive removable gum. I ordered one today for less than 3Euro, I will try it and adopt it if it's better than my frankenstein flat gamepad creation. Also , on the same theme I read yesterday this great review and this other one from the anime artist Saejin. ( sorry for the video quality, this was shoot with a cheap photo camera with a 640x480 video function , not a real movie camera ) The result work well and do the job. Not 100% ideal because of the design ( hard plastic would be better ) and for the size a bit too big to my taste ( still not flat enough ). For sure this not correct the ergonomical problem of the Cintiq , but bring a bit more confort to work with , especially during the long hours of painting when keeping focused is important. License: CC-BY David Revoy, www.davidrevoy.com, 14 july 2011 . Woah. A Cintiq. I've tried one once and I felt in love... Hope to get one someday ! Anyway, this trick is interesting! Nice setup, did you tryout easystroke. Joli gadget en tout cas ! Tu dois passé un temps fou sur la confection de ces bidules. It almost goes against the logic that such high end professional products like Cintiq have such basic usability issues like terrible ergonomics, doesn't it? I've actually just bought a Razer Nostromo (http://goo.gl/7MPrP)- the successor to the highly recommended nostromo speedpad n52. It is recommended by tons of Comic and concept artists. I've found it has slightly too few buttons for blender, but seems nice for 2d apps. (I've not given up on using with Blender yet, it just needs more tweaking) I've also not been able to find current linux drivers for it and have been trying to get it to work with the n52 drivers(http://goo.gl/byJpf). Is very ergonomic though and works well in Windows at any rate. A $2000 tablet and a $4 key pad ...it really shouldn't be necessary, but as long as it works. I still use a Wacom tablet with a small keyboard that I left hand shortcuts with. It's engenuity like this that makes manufacturers improve their products. Nice work! I love Wacom Cintiq. But I haven't money to buy... I using only my Bamboo Wacom just to play with MyPaint. Applicable to any USB keypad, BTW. @AbeOwitz : Hey , good if you get inspired by this. The device you found is cute, and thanks a lot for the edev config. It makes me want to buy one, print on it a chroma wheel on a thin sticky paper, and build a 'touch' sensitive color changer for Mypaint ( in Mypaint, we can control Hue/Sat/Lum with keystrokes now, and a user reported me he already can choose an exact color only keyboard based, a good geek painting skill :) ). For your problem about binding keystrokes as Ctrl+S ( multiple key ) just change the shortcut in Mypaint ( mouse over the item in the menu + press on the fly the key ) , you can surely assign 'S' to it. For sure it not fix the compatibility with other softwares , but it can help. I see you have 3 pens. Can you tell us how do you use them? They have different nibs? Different grip? Or you assign a different color to each one? I have an intuos4 but it was delireved with 2 changeable grips. One very thick and the other thin. I don't remember which one was on the by default because I tried to use both of them with the fear of break something, because you need to push very hard. Tonight I will try to install Linux Mint with your tutorial. Yesterday I bought the joypad. The only different things I have to set are that I'm left handed and that I've a dual screen with pivot and to set up a few things on compiz. So what I need to do is to rotate the desktop with a key and at the same time to rotate the tablet, because I can't use the tablet in horizontal and the monitor in portrait mode. What I use to solve this is to set a command in compiz. With Compiz Config Settings Manager there is an icon called Commands. btw I do this on a old ubuntu karmic, I know the command in Lucid is different but I'm not on the Lucid's computer now. (maybe the first option is not necessary with recent Gimp versions, it is taken by the one I've on Karmic). They let me have a thin toolbar without the close and window resize buttons. And also the toolbar can't be resized, that prevents to resize the toolbar when you grab it and move it. I also use the screenshot compiz plugin so I can just press a key+right mouse button select an area and automatically I've a screenshot on the Desktop. Also in Gnome I go in System ->Prefernces-> Windows and I set Select Windows when the mouse moves over them. It makes my life easier so I don't have to check if the window have focus or not. But when I don't draw I set it off because it can be confusing. @Marco : Thanks for sharing your usage settings. Hope you will find similar feature with Linux Mint 11 ( I almost sure nothing changed too much , in the linuxwacom wiki there is on the xsetwacom page a table with old terms and new corresponding key words, so this should works. ) . Feel free to repost this when proofed for Linux Mint on the Linux Mint blog post. I'm sure it can help poeple, and with this info , I'll can also update my page. Good luck for your system updating. Please, is it possible to have a map of the keys you use on the joypad with gimp and mypaint? I'm really curious. and left and right for opaque and transparent. is there a way to bind two keys (like shift+s) with qjoypad? I got one of those for the same reason. I've never looked back since. The drivers are windows only so to do the original setup you either have to do it via 'wine' or on a windows laptop. But you only need to do that once, the setup gets uploaded on the controller and your settings stay with you wherever you take it. Very cool device for painting and 3D. Whaaaou ça c'est de la bidouille ! "Error: you will need libxtst to compile this program"
pourrais tu m'indiquer quoi faire? Désolé, j'ai abandonné cette solution ( article de 2011, ça à 5 ans ) car QJoypad devenait de moins en moins testé et maintenu. J'ai également abandonné les Cintiq en général. je vais essayer de trouver une autre solution, j'ai fini par tomber sur un site "P.I Engeneering" qui propose un petit clavier d’appoint entièrement programmable. et merci pour tout ce que tu fais pour la communauté. Ha oui, ça me rappelle ce que j'ai vue sur ce setup d'un Japonais mangaka: https://www.youtube.com/watch?v=p-sEn6CNDZk ; une belle réalisation qu'il entoure d'au moins trois clavier du même type. on reconnaît là bien la patte des japonais, avec leur amour dur matos et leur méticulosité. Du coup tu utilises quoi pour bosser? Tu fais peut être de la télékinésie pour dessiner ! A présent, je garde et bosse sur ma vieille Wacom Intuos3 A4 sur mon PC, et sur le laptop en voyage: j'utilise une plus petite Intuos4 Medium (qui rentre dans le sac) . Je n'aime pas le côté trop modal de la Cintiq ( impossible de taper au clavier confortablement tout en dessinant, obligation de basculer l'écran en permanence ) alors que j'aime continuer à répondre à des commentaires (comme maintenant), ou trainer sur IRC ; faire une recherche dans mon dossier musique, etc pendant un painting. Connais tu le Cintweak ? http://www.gizmotweak.com/ , j'en ai entendu du bien. J'ai fait un système rudimentaire de cale pour faire tenir un clavier en haut de ma cintiq. du coup j'ai deux claviers, un posé en haut de ma cintiq (équilibre à perfectionner) et un autre en face de mon écran "régulier". je continue à utiliser les touches latérales de la cintiq, mais avec cette nouvelle disposition, je sens moins le besoin d'avoir des touches de raccourcis en plus. reste à voir si cette solution va être viable à long terme pour le flux de travail et le confort. j'ai également conservé ma vieille et increvable intuos pour les même raisons que toi. merci pour tes réponses et pour le lien vers le Cintwaek.